Having visited the Greek Island of Santorini for a holiday back in 2012, we have been looking for a couple willing to visit Santorini for a shoot. When we met Arti & Nick last year we put forward the idea for a pre wedding shoot, and without any hesitation Arti & Nick agreed. We are so excited to share with you the Destination Pre-Wedding Shoot Santorini. Those of you who have visited Santorini will know that it’s a visually stunning location however Santorini comes with its own challenges with its rugged landscape. As well as a photo shoot Arti & Nick wanted to create a music video that could be shown to their guests before their reception entrance. We had the challenge of creating a music video and to carry out a photo shoot within three days. The X-quisite crew flew out a day before the couple so that we could scout the island for locations. Several challenging locations were selected before their arrival. Arti & Nick took an early morning flight to Santorini and arrived early afternoon. Without any sleep the night before, we set off on our first and the most challenging location, which was to climb the Skaros rock. Skaros is a rocky headland that protrudes out to the azure blue Aegean Sea and requires a steep climb, as you get closer to the peek. Once on top the Skaros rock this location provided an opportunity to capture some stunning images, on one side with Santorini’s iconic white buildings protruding out of the mountain and the other with clear open ocean with the beautiful sunset. The remaining days we covered all parts of the island from south to north, ending with an afternoon shoot at the busiest part of the island Oia. The X-quisite team would like to thank Arti & Nick for giving us the opportunity to be part of this journey. This has been by far one of the most memorable destination shoots. 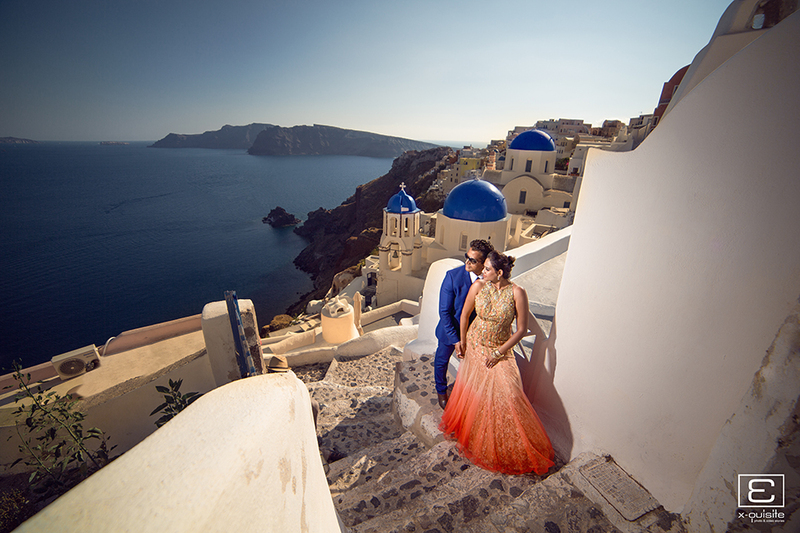 Below is the full album layout for the Santorini Pre-Wedding Shoot with Arti & Nick.